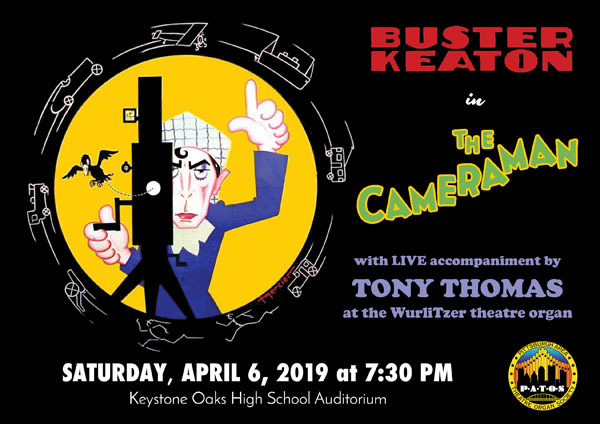 Enjoy Buster Keaton’s 1928 silent comedy classic The Cameraman with live theatre organ accompaniment by Tony Thomas. Keaton plays one of the worst newsreel photographers of all time — hounded by a mischievous monkey — with hilarious results! Organist Tony Thomas will be making his fourth appearance for PATOS. His artistry will treat patrons to silent film as it was originally intended to be shown: with live organ and on the big screen! Thomas is a nationally known pianist/organist/keyboardist, currently based in Memphis. Although Tony earned a Bachelor of Music Degree in Organ Performance under Gerhard Krapf at the University of Iowa in 1968, he is known best as a jazz artist. Improvisation is his forte. A love of the theatre organ came early in his musical life when, at age 8, he heard his first recordings of George Wright. Not long after that, Tony was fortunate to see and hear the Count Basie Orchestra perform in person, and even “sat in” with the band’s rhythm section at rehearsal. From that moment on, he was “hooked” on swing. By age fourteen he was performing regularly on a 3/15 Barton in a local roller rink, and at age 15 became the youngest soloist ever to give a concert on the newly-installed 4/34 Wurlitzer at the Senate Theatre in Detroit. Almost from his first acquaintance with the theatre organ, Tony was playing the instrument but hearing a big band in his musical ear! His jazz influences are numerous, but probably Erroll Garner, Milt Buckner, George Shearing, and Bill Evans have helped to shape his musical conception on theatre organ – even though Tony has spent a lot of time over the years in small jazz ensembles on Hammond B3, doing the “nitty-gritty” thing as well. He is a five-time winner of the N.A.R.A.S. (the “Grammy People”) Premier Player Award for Keyboards and/or Piano and was inducted recently into that organization’s Premier Player Hall of Fame. He has recorded literally thousands of commercial music tracks as well as cuts with Joe Walsh, U2, Jimi Jamison (lead singer of the band “Survivor”), and, in Spring 2005, an album of standards with internationally known opera star, Kallen Esperian. Tony has performed with Al Jarreau, David Sanborn, Hank Crawford, and the late Richard “Groove” Holmes. To purchase tickets, please click on the following link: https://www.showclix.com/event/thecameraman. Admission is $15 in advance, or $20 at the door. Students are free with ID. Clark Wilson will perform concert selections and accompany several Laurel and Hardy silent film shorts. A native of Ohio, Clark Wilson began his musical training at age nine. While growing up he accompanied numerous stage musicals and was organist at several churches. Following several years with the Schantz Organ Company as a reed voicer and tonal finisher, Clark’s professional playing career began with his appointment to the featured organist post at Pipe Organ Pizza in Milwaukee, Wisconsin. He has since been on the playing staffs at the Paramount Music Palace in Indianapolis, Indiana; Pipes and Pizza in Lansing, Illinois; and is currently associated with Organ Stop Pizza in Mesa, Arizona, where he is on the organ staff as well as having assisted with the planning and installation of the world’s largest Wurlitzer organ. Clark’s recording credits include seven albums. He has given all-transcription recitals for the AGO, played for the 1990 Organ Historical Society convention, and performed at numerous National and Regional conventions of the ATOS, as well as giving a series of highly lauded workshops for young people’s Pipe Organ Encounters. Considered one of the finest practicioners of the art of silent picture scoring, he has also been a visiting lecturer on Theatre Organ and photoplay accompaniment for the Indiana University organ department. He has now developed curriculum and has been appointed to the organ faculty at the University of Oklahoma’s Organ Department, where he teaches applied theatre organ lessons, silent film scoring, and the history of the American theatre organ. He has concertized in the United States, Canada, Australia, and England, and done extensive silent film accompaniment, including at the Chautauqua Institution in New York, the Packard Foundation’s Stanford Theatre, UCLA, and the Fox Theatre for the Atlanta premier of the restored Metropolis. He plays a silent picture annually on the organ series at LA’s Walt Disney Concert Hall, has scored for Kino International for commercial release, and has performed at both the Cinequest and San Francisco Silent Film Festivals, as well as for the Los Angeles Conservancy. 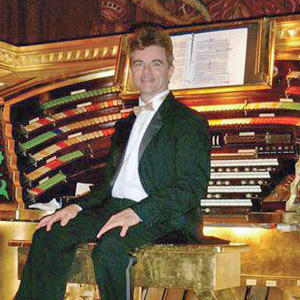 Since 1992 Clark has served as Resident Organist and organ conservator at the famed Ohio Theatre in Columbus, Ohio (for the Columbus Association for the Performing Arts) and was chosen by them to repremier the renowned Chicago Theatre Organ on a bill that included him accompanying popular singer Michael Feinstein. He also headed the professional crew that began restoration on the Chicago’s landmark Wurlitzer for CAPA. Along with a busy concert schedule, Wilson runs his own pipe organ business and is heavily in demand as a tonal consultant and finisher of both theatre and classical pipe organs; he has been given the singular honor of being brought to England multiple times for tonal finishing and consulting. He has received both the Technician of the Year and Organist of the Year awards from the American Theatre Organ Society, the only person to have done so, and his time is now nearly equally divided between concert and technical work. He has been professionally involved with more than 100 organ installations throughout North America and England and has provided consulting and voicing expertise for several different organ companies. To purchase tickets, please click on the following link: https://www.showclix.com/event/clarkwilson. Admission is $15 in advance, or $20 at the door. Students are free with ID.